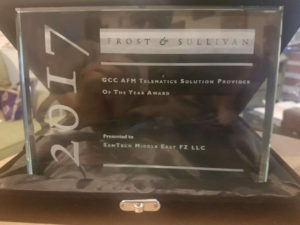 SamTech was awarded Frost & Sullivan’s 2017 Best GCC AFM Telematics Solution Provider in edge intelligence-analytics. 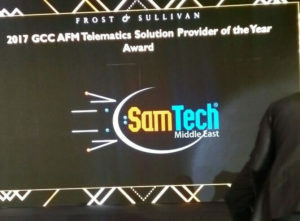 The firm recognized SamTech is pioneers in the IoT solutions industry and vehicle telematics arena specifically, since it was established almost 13 years ago the company has diversified its portfolio to multiple niche solutions that serve different industries. SamTech has has emerged as a leader in the region for providing platforms for the development and integration of state-of-the art innovative solutions, which integrate GPS, GPRS/3G/4G/Satellite, and other wireless technologies with leading vendors in the IoT industry. We strive to bring groundbreaking 360 degree turnkey solutions that meet with client requirements which enable smarter decision making, enhance reliability, boost productivity, increases operational efficiency. Frost & Sullivan, the Growth Partnership Company, enables clients to accelerate growth and achieve best-in-class positions in growth, innovation and leadership. The company’s Growth Partnership Service provides the CEO and the CEO’s Growth Team with disciplined research and best practice models to drive the generation, evaluation, and implementation of powerful growth strategies. Frost & Sullivan leverages more than 50 years of experience in partnering with Global 1000 companies, emerging businesses, and the investment community from 45 offices on six continents. To join our Growth Partnership, please visit http://www.frost.com.